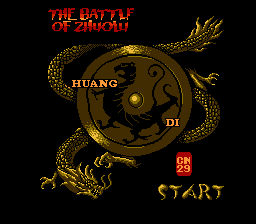 This is the fully English translated version of the Chinese game Huang Di - The Battle of Zhuolu for the NES. 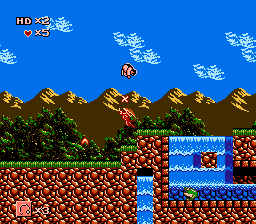 The game is a platformer, in which you control Huang Di, the Yellow Emperor, as he battles the evil forces of Chi You. According to the Chinese mythology, Chi You, with the giants, Jiuli tribes and evil spirits, rebelled against the Yellow Emperor at Zhuolu plains. 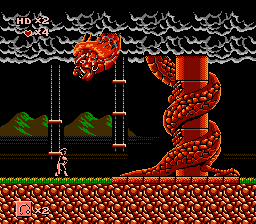 Both sides used magical powers, but Chi You had the advantage of forged swords and halberds. Using his powers, Chi You covered the battlefield in thick fog. 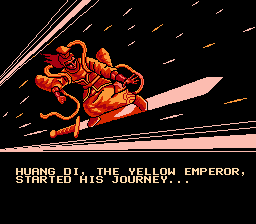 Only with the help of a magical south pointing chariot could the Yellow Emperor’s troops find their way through the mist. Enjoy a piece of Chinese History!! !